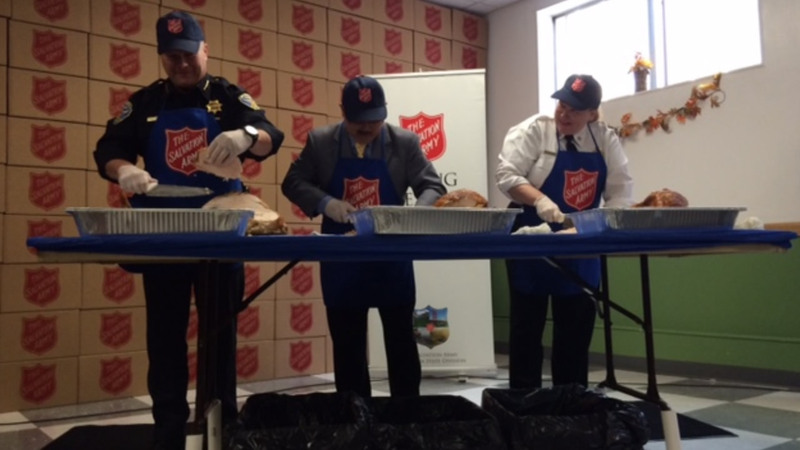 SAN FRANCISCO -- San Francisco's mayor, police chief, fire chief along with dozens of members of the police and fire department carved over 120 turkeys Wednesday morning for delivery to 3,400 homebound San Francisco residents this Thanksgiving. This year marks the 60th year of turkey carvings at San Francisco's Salvation Army offices and once again Mayor Ed Lee, police Chief Greg Suhr and fire Chief Joanna Hayes-White energetically carved up turkeys for those individuals who cannot leave their homes because of advanced age or illness. While the trio joked about each other's carving techniques, this year was less competitive than years past, according to the Salvation Army staff. "The purpose, of course, is to serve those who are in need," Lee said. The mayor said the holidays are "a time when there is a lot of need" in the city, adding that while the city is doing a lot to help those in need, it must and will do more. Over carols performed by the Salvation Army's brass band this morning, Salvation Army Maj. Michelle Pierce said the turkey meat, along with stuffing, gravy, cranberry sauce, yams, hot cocoa and other accoutrements, would be hand-delivered Thursday by roughly 500 volunteers. She said the hand-delivery of meals is a treat not only for the individuals who receive the food, many of whom are shut-ins, but also to many families who have been volunteering with the Salvation Army every Thanksgiving for generations. Pierce said the recipients of the food have been recommended to the Salvation Army from various community organizations and that the interaction with volunteers lifts the spirits of many who are homebound. She said for some recipients, a visit from a Salvation Army volunteer is the only contact from the outside world that they will receive that day. Beginning at 4:30 a.m. on Thursday, the Salvation Army's Harbor Light Center in the South of Market neighborhood will be staffed with graduates of The Salvation Army's drug and alcohol recovery program, and meals will be individually packaged and ready to serve. At about 7:30 a.m., 500 volunteers, including both drivers and passengers, will head out on 150 routes to deliver meals across the city, continuing throughout the morning until all meals have been delivered. The Salvation Army estimates that the annual meal delivery program requires four-and-a-half days of round-the-clock cooking to prepare roughly 4,500 pounds of turkey, 800 pounds of green beans and 1,080 pounds of yams. Another turkey carve event, featuring the mayor and both chiefs, will take place at 4:30 p.m. today at St. Anthony's, which will go toward feeding roughly 3,000 homeless and hungry individuals in the city.